Vélo Vogue: The Flower Bandit Strikes! When was the last time something totally unexpected happened to you and brightened your day? For me, it was yesterday. 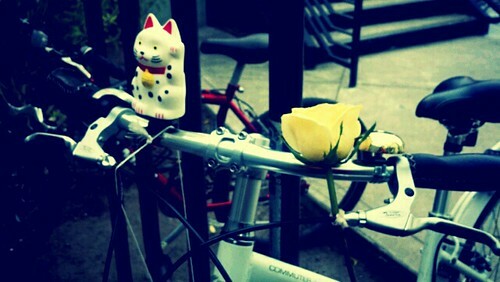 I went to my usual Monday night yoga class at the gym, and when I emerged, there was a gorgeous yellow rose attached to my handlebars. It felt like I had a secret admirer! 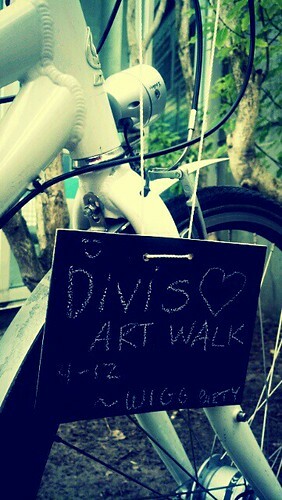 When I went to unlock from the bike rack, I noticed that my admirer had left me a sweet message, with an invitation to art and party! I ride the Wiggle almost every day. It's an infamous strip of bike route in the Lower Haight that makes commuting home sane and reasonable. 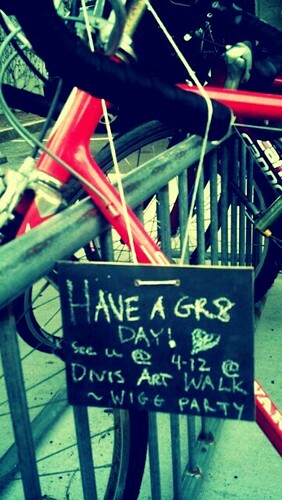 It's also a great place to run into bike friends. 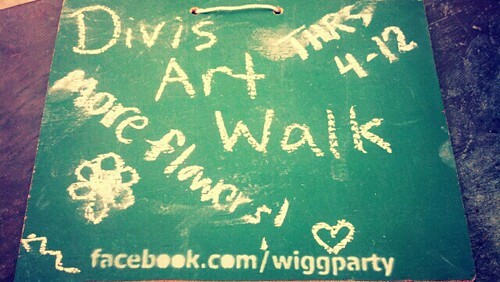 A group of forward-thinking residents of the Wiggle have organized a party, appropriately called the Wigg Party. Self-described as "Urban Sustainability Guerrillas," here's a little more background: "The Wigg Party is a community organization based in the San Francisco neighborhoods surrounding the bike route known as the Wiggle. Our mission is to make the community that uses the Wiggle a leader in the transformation to sustainability and resilience." They sound like my kind of people. This week on Thursday, April 12th, the party is going down at The Independent, also the same night as the Divisadero Art Walk. So really, how could you go wrong? Join the Wigg Party's facebook page to stay informed. And come out to party on Thursday! And thanks to the Wiggs for adorning my bike with a fragrant flower!